A major global partnership has announced an injection of cash for researchers seeking to develop the first new class of antibiotics in more than three decades as well as other ways to defeat deadly antibiotic-resistant superbugs. On Thursday, Combating Antibiotic Resistant Bacteria Biopharmaceutical Accelerator (CARB-X) announced it will give $24 million in immediate funding for 11 biotechnology companies to tackle the problem of superbugs from several different approaches. The partnership will also invest an additional $24 million in additional payments over three years if the biotechs meet specific milestones. CARB-X is a public-private partnership between four life science accelerators in the US and the UK ‒ Wellcome Trust of London, the California Life Sciences Institute, Massachusetts Biotechnology Council and the AMR Centre ‒ designed to move promising antibiotic candidates through the earlier stages of research and development so they can advance to the approval stages with the US Food and Drug Administration (FDA) or the Medicines and Healthcare products Regulatory Agency of the United Kingdom (MHRA). Boston University is the lead institution for the organization. The partnership was announced last July with the goal of setting up a diverse portfolio of more than 20 antibacterial products. The 11 projects announced Thursday, all of which are in the early stages of research, are the first steps in creating that portfolio. 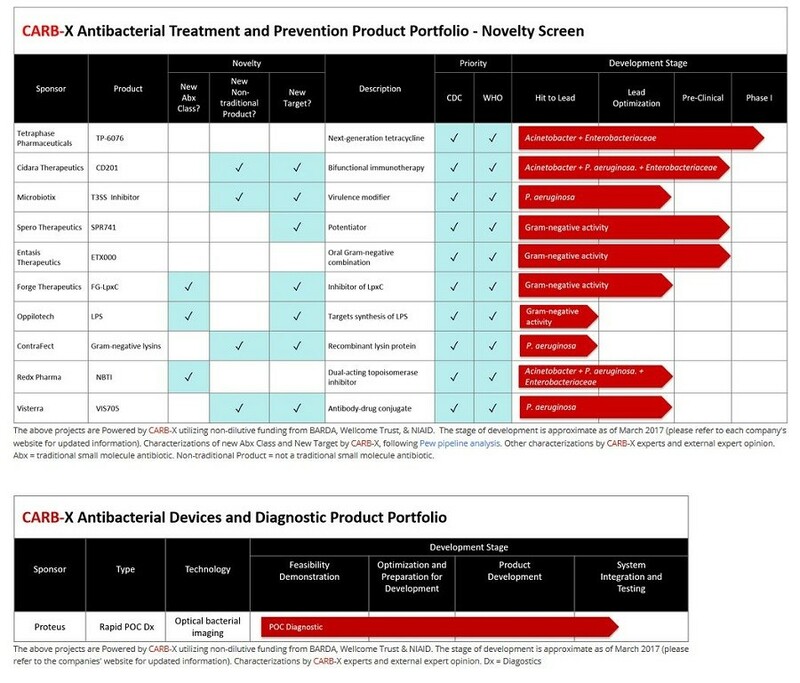 “By accelerating promising research, it is our hope that we can speed up the delivery of new effective antibacterials, vaccines, devices and rapid diagnostics to patients who need them," CARB-X Executive Director Kevin Outterson said in a statement, noting ”there is always a high risk of failure” for projects in the early research stages. “But if successful, these projects hold exciting potential in the fight against the deadliest antibiotic-resistant bacteria," he added. Of the 11 current projects, eight are based in the US and three are in the UK. They also have diverse approaches to attacking drug resistance. Three of the companies are working to bring the first new classes of antibiotics to the market since 1984. Four others are looking to boost the human immune response and disable pathogens’ ability to grow through nontraditional therapeutics. Another company is focused on developing a diagnostic imaging tool for lung infections that could identify the type of bacteria causing the illness within 60 seconds. All of the projects target Gram-negative bacteria ‒ the main focus of a February World Health Organization (WHO) report on “priority pathogens” ‒ because they are resistant to multiple antibiotics, have built-in capabilities to find new ways to resist treatment and can pass along genetic material that allows other bacteria to also become drug resistant. Despite the urgent necessity of new classes of antibiotics, the research and development for such drugs has been declining “due to reduced economic incentives and challenging regulatory requirements,” according to an April 2015 study published in the Pharmacy & Therapeutics journal. Only three of the 18 largest pharmaceutical companies were still in the antibiotic field as of two years ago. Even when new antibiotics are created, doctors try to prescribe them only in "last-ditch cases" to prevent resistance, Outterson said during the announcement, describing one of the lack of incentives for pharmaceuticals. And bacteria will eventually become resistant to any antibiotic, making them "the only drug class where we have to start all over every time we succeed," Outterson said. Not included in the initial CARB-X portfolio is the promising new antibiotic teixobactin, which researchers discovered in “a grassy field in Maine,” or the iChip, the tool used to grow teixobactin ‒ and other “uncultured” antibiotics ‒ in a lab. Northeastern University received a $9 million grant in July from NIH’s National Institute of Allergy and Infectious Diseases (NIAID) to fast track their method of identifying and growing other uncultured antibiotics. "There are a number of bottlenecks in natural product discovery," Dr. Kim Lewis, director of Northeastern’s Antimicrobial Discovery Center, said in a statement. "Our aim is to resolve these bottlenecks and improve our efficiency by a couple of orders of magnitude." From Swedish stool samples and Tasmanian devil’s milk to raw honey, black silicon and nanoparticles, scientists seem to be grasping at straws over the last few years to try and prevent antibiotic-resistant bacteria from taking over the world. 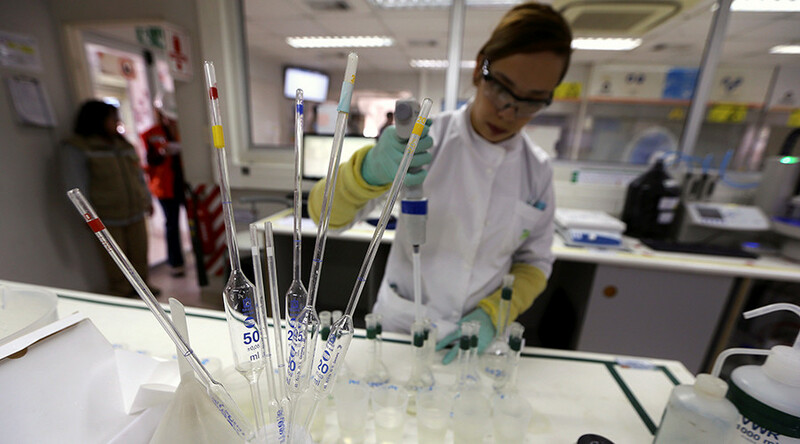 The race to find a fix took on new urgency at the end of February, when the WHO announced the pressing need for the creation of new drugs to tackle 12 superbugs that are resistant to all antibiotics, noting that such resistance is on the rise. The first antibiotics were developed in the 1940s, and quickly became over-prescribed to combat not just bacterial infections but viral illnesses as well, even though viruses do not respond to such treatments. Its use in animal feed to promote weight gain has also proven problematic, and the FDA began the process to eliminate the use of antibiotics in feed at the end of 2013. The over-reliance on antibiotics and their use in feed has allowed bacteria to adapt to the drugs, making them less effective over time. At least 2 million Americans are infected with antibiotic-resistance illnesses each year, and at least 23,000 people die annually from those diseases, according to the US Centers for Disease Control and Prevention. In September, a woman in Nevada died from a superbug resistant to all 26 antibiotics available in the US.